Why Is Iron (Steel Sheet) Good for Frying Pans? Food needs to be cooked in high temperature at approximately 170–180°C in order to bring out its best flavor. Iron is a material with higher heat resistance, and is also the one best-suited to storing and releasing heat. In other words, not only is it able to store abundant amounts of heat, it is also able to release just the right amount of heat in order to bring out the best in most ingredients. These properties enable food to be cooked quickly at high temperatures, all without losing any delicious flavor. Many Chinese dish cooks stir-fry ingredients by forcefully striking a wok with a metal ladle, something that is only possible with strong iron. On top of that, the pan is also easy to restore to mint condition even if it is burned. And the greatest advantage they bring lies in the fact that the more you use them, the more the oil and metal mix together to make them work even better. Unlike teflon, which degrades after several months at worst and several years at best, a good iron pan that is properly cared for can be passed on from parent to child to grandchild and beyond, for decades and decades. They are not disposable tools meant to be worn out and replaced. They are tools that are meant to be cared for, that can be made into something better than they were when they were first purchased. River Light does not, and will never, use cold-rolled steel sheets containing radioactive substances (especially since none exist among Japanese steel sheets). A fatal accident occurred at the Fukushima Power Plant as a result of the great East Japan earthquake and tsunami that took place on March 11, 2011. Ever since, a fear of radiation and radioactive substances has enveloped all of Japan. In the wake of that accident, we have received questions asking if the steel sheets we use in our frying pans contain radioactive substances. Even though we have answered that they do not, some customers remain unconvinced. That is why we would like to take this opportunity to lay out just why we can be so sure that our frying pans are fine. River Light's current CEO was born in Hiroshima during World War II, in a location no more than 250 meters away from what is now the Hiroshima Peace Memorial, and he has studied radiation and radioactive substances more than most. And not only do all of our employees continue to receive lectures from our CEO, each one is also constantly working to learn the basics of radiation and radioactive substances. Ever since the Fukushima incident, they have been making inquiries to our steel sheet manufacturers. 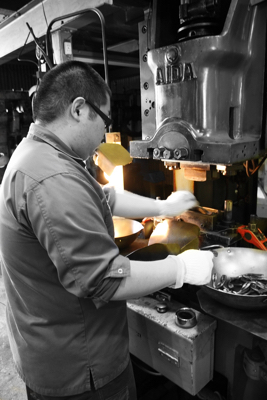 At River Light, we only use cold-rolled steel sheet SPCC made by Nippon Steel Corporation for our frying pans. When Japanese steel sheet manufacturers make steel sheets, they use iron ore and scrap for their raw materials. Iron ore is imported from Australia, Brazil, and other countries, so there is no problem there. The problem is whether or not the scrap procured in Japan, and whether or not it might possibly have radioactive substances on its surface. In response, Japanese steel sheet manufacturers conduct tests on all of their scrap that enable them to tell with perfect certainty whether or not a given piece of scrap contains radioactive substances. Naturally, any scrap that is found to be radioactive is not used in the manufacture of steel sheet. This is the rigor with which Japanese steel sheet manufacturers approach their craft. Therefore, we can say with certainty that the aforementioned cold-rolled steel sheet SPCC we use to make our frying pans is not radioactive whatsoever. (We have also confirmed this matter with the above Japanese steel sheet manufacturers and have received a clear and definitive answer, which is why we continue to use their material in our products).